Host Depot Review 2019: Is Host Depot a Good Hosting? Host Depot is a full-service host with a huge range of hosting services. Its premium-priced flexible plans allow customers to configure as needed. Florida-based Host Depot was founded in 1997 and owns its own 22,000 square foot data center. It is a full-service host that has notched up many industry awards. The company website is in English, as is their support. Let’s start by digging into the details of the data center that has redundant OC-12 internet connections, redundant UPS power backup, redundant generator power backup, and a redundant Liebert controlled environment. The robust Dell servers have dual quad-core processors, RAID-5 Ultra SCSI disk arrays, and redundant power supplies. These characteristics allow Host Depot to offer 99.9% uptime guarantee that is backed by a solid service-level agreement. Now onto the shared hosting plans themselves, and the thing that strikes me most is the long list of included features. Whether you choose the Starter (10 GB disk space), Business (25 GB disk space), Corporate (50 GB disk space), or Enterprise (100 GB disk space) plan, you’ll get a lot of value-added features right out of the box. For experts, all plans come with support for the .NET framework (ASP.NET), Perl, and PHP, as well as multiple MySQL databases and one Microsoft SQL database. Beginners have access to the SiteBuilder website creator, but not in the base package. Given the level of resources, I am surprised not to see a one-click installer too. What’s really good about Host Depot is the flexibility. As well as giving customers the choice of Windows or Linux operating systems, you can select add-ons to configure your base package as needed (at additional cost, of course). The add-ons I’m talking about are increased disk space, domain pointers, email accounts, server space, DVD backups, and SSL certificates of various types. I like this flexibility, but it’s a pity you have to pay for it. 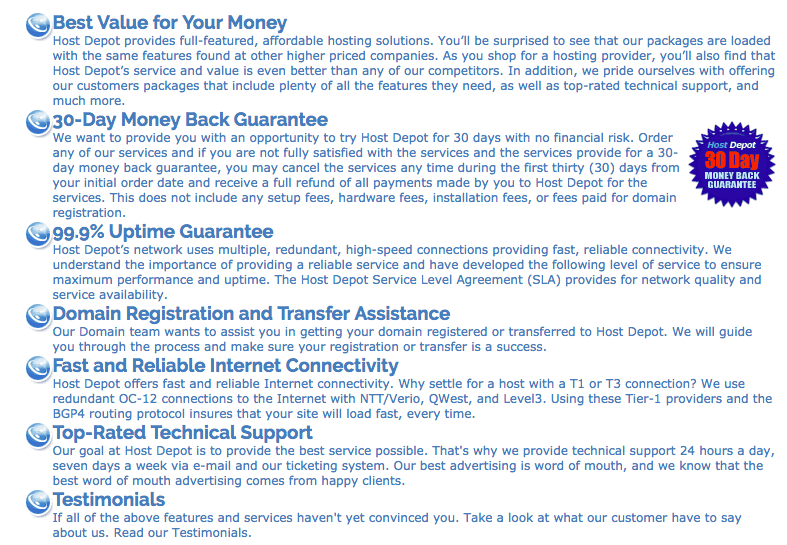 As already hinted, Host Depot’s flexible features are pitched at a premium price point. However, you can keep in mind that the price includes a free domain registration (not .com), a shared SSL certificate, and no setup fee. Plans can be bought on one-month to three-year terms; the longer the term, the bigger the discount of between 5% and 15%. You also get a 30-day money-back guarantee which means you don’t need to worry quite so much about committing to a long term. Existing customers can access 24/7 support by email and ticketing system. According to the Host Depot website, you can expect a response in less than 24 hours. Note that questions not directly related to Host Depot services will be billed. Prospective customers can contact the company during weekday business hours by phone, fax, email, or snail mail (letter). From comprehensive plans to customer service, Host Depot ticks all the boxes. 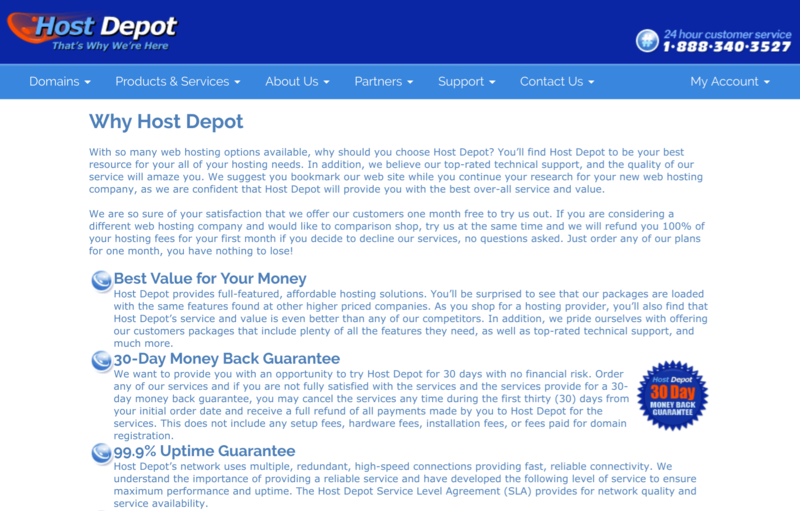 If you’re willing to pay a premium price for a solid host, do yourself a favor by checking out Host Depot. Wondering how Host Depot stacks up against other Web Hosting companies? Enter any other Web Hosting company and we will give you a side-by-side comparison.